One of the problems with keeping the news of a recent engagement a secret is that, sometimes, an investment banker runs off and tells your parents before you can. 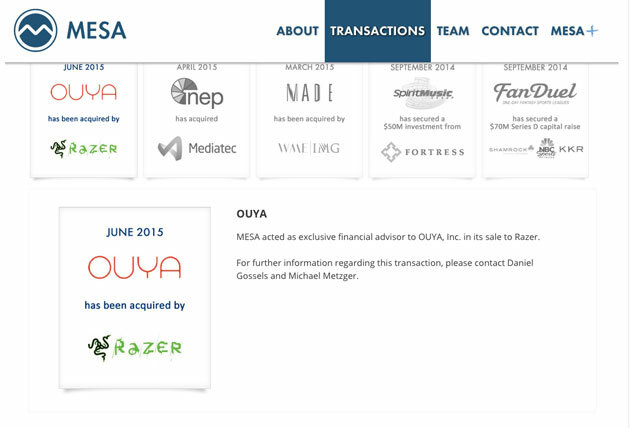 That's the sticky situation that has met Razer and Ouya, since their recent union has been revealed by the latter's advisors at Mesa Global. The news comes a week after the first rumors that corporate wedding bells were in the air, which was met with a non-denial from the high-end gaming company. There's no word on the specifics of the deal, but like an angry relative, we've sent Facebook messages to representatives of both companies in the hope of getting a picture of the ring. Still, if Razer CEO Min-Liang Tan had any big announcements ready for E3, they probably just got ruined. Bankers, eh?